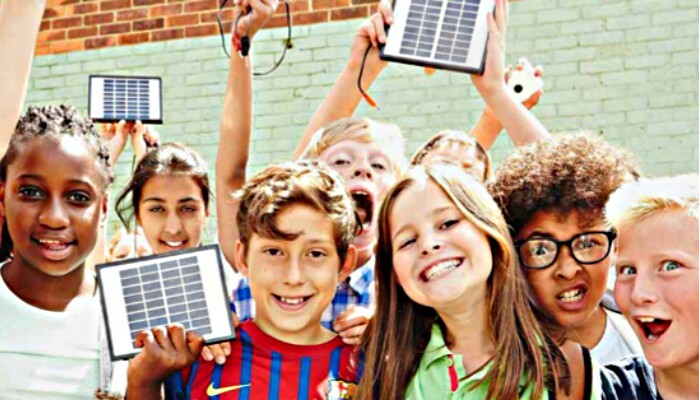 For the coming 2015–16 school year, Solar Schools will be building 20 teams for a year-long crowdfunding effort involving hundreds of people and offering two different ways for schools to go solar — Solar Schools Classic and Solar Schools Community. For schools with big roofs (or smaller fundraising ambitions), Solar Schools recommends the Solar Schools Community model. With Solar Schools Community, schools raise £5,000+ ($7,700+) and invest in a larger solar roof through a Community Benefit Society. The Community Benefit Society then oversees the installation, and owns the solar panels on the school roof. The school then enjoys a reduced price for electricity, gets a return on their investment for 20 years, and enjoys being responsible for eliminating a lot of carbon emissions from the Earth’s atmosphere. For schools with small roofs (or big fundraising ambitions), Solar Schools suggests going with the Solar Schools Classic model. With the Solar Schools Classic program, schools raise £8,000–15,000 ($12,300–23,100), and own their own solar panels outright. Also, from day one, schools get 100% of the income made from selling excess energy back to the grid, and likewise feels great about huge carbon emission reductions. Regardless of which program is chosen, Solar Schools promises to provide schools “with the tools and support they need to raise more than they ever have before.” For some, says Solar Schools, “that might be £5,000 ($7,700), for others, £50,000 ($77,000).” Whatever the amount might be, excitement builds when a school sets a fundraising goal for its very own solar project, and then magic happens when everyone chips in to help make the goal become a reality. This is an excellent opportunity for everyone from local businesses, community organizations, former and current students, teachers, and parents to give back to their local schools and do something positive about global warming at the same time. Solar Schools offers a really unique way of making that happen, by installing clean, renewable energy on school rooftops — Could your school be next?